For other uses, see Kosala (disambiguation). Kosala (Sanskrit: कोसल) was an ancient Indian kingdom, corresponding roughly in area with the region of Awadh in present-day Uttar Pradesh. 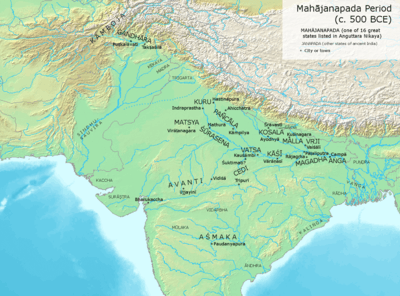 It emerged as a small state during the late Vedic period, with connections to the neighboring realm of Videha. According to the Buddhist text Anguttara Nikaya and the Jaina text, the Bhagavati Sutra, Kosala was one of the Solasa (sixteen) Mahajanapadas (powerful realms) in 6th to 5th centuries BCE and its cultural and political strength earned it the status of a great power. However, it was later weakened by a series of wars with the neighbouring kingdom of Magadha and, in the 4th century BCE, was finally absorbed by it. The mention of Kosala is not found in the early Vedic literature. It is mentioned as a region in the later Vedic texts of the Satapatha Brahmana and the Kalpasutras. In the Ramayana, Mahabharata and the Puranas the ruling family of the Kosala kingdom was descended from king Ikshvaku. 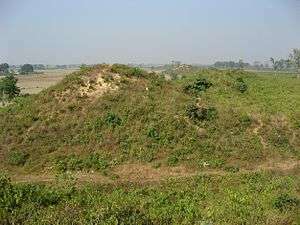 The Puranas give lists of kings of the Aikhsvaka dynasty (the dynasty founded by Ikshvaku) from Ikshvaku to Presenajit Dhaka (Pasenadi). According to the Ramayana, Rama ruled the Kosala kingdom from his capital, Ayodhya. A Buddhist text, the Majjhima Nikaya mentions Buddha as a Kosalan (which indicates that Kosala may have subjugated the Shakya clan, which the Buddha is traditionally believed to have belonged to) and Mahavira, the 24th Tirthankara of Jainism taught in Kosala. In the time of king Mahakosala, the conquered neighboring kingdom of Kashi had become an integral part of the Kosala kingdom. Mahakosala was succeeded by his son Pasenadi (Prasenajit Dhaka). He was a follower of Buddha. During his absence from the capital, his minister Digha Charayana raised his son Vidudabha Virudhaka to the throne. Not much later, the Kosala kingdom was absorbed into its expanding neighbor, the Magadha kingdom. The Ikshvakus were the ruling clan of Kosala (now Oudh or Awadh). They were defeated by Ajatashatru of the Haryanka dynasty. It is assumed that during the Mauryan reign, Kosala was administratively under the viceroy at Kaushambi. The Sohgaura copper plate inscription, probably issued during the reign of Chandragupta Maurya deals with a famine in Shravasti and the relief measures to be adopted by the officials. 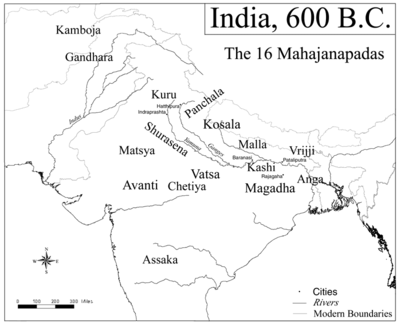 The Yuga Purana section of the Garga Samhita mentions about the Yavana (Indo-Greek) invasion and subsequent occupation of Saket during the reign of the last Maurya ruler Brihadratha. The names of a number of rulers of Kosala of the post-Maurya period are known from the square copper coins issued by them, mostly found at Ayodhya. The rulers are: Muladeva, Vayudeva, Vishakhadeva, Dhanadeva, Naradatta, Jyesthadatta and Shivadatta. There is no way to know whether king Muladeva of the coins is identifiable with Muladeva, murderer of the Shunga ruler Vasumitra or not (though a historian, Jagannath has tried to do so). King Dhanadeva of the coins is identified with king Dhanadeva (1st century BCE) of Ayodhya inscription. In this Sanskrit inscription, King Kaushikiputra Dhanadeva mentions about setting a ketana (flag-staff) in memory of his father, Phalgudeva. In this inscription he claimed himself as the sixth in descent from Pushyamitra Shunga. Dhanadeva issued both cast and die-struck coins and both the types have a bull on obverse. ↑ Samuel, Geoffrey (2010), The Origins of Yoga and Tantra: Indic Religions to the Thirteenth Century, Cambridge University Press, pp. 61–63 . ↑ Raychaudhuri 1972, pp. 85–6. ↑ Raychaudhuri 1972, p. 89. ↑ Law 1973, p. 132. ↑ Pargiter 1972, p. 257. 1 2 Sastri 1988, p. 17. Bhandare, S. (2006), Numismatic Overview of the Maurya-Gupta Interlude in P. Olivelle, ed., Between the Empires: Society in India 200 BCE to 400 CE, New York: Oxford University Press, ISBN 0-19-568935-6 . Falk, H. (2006), The Tidal Waves of Indian History in P. Olivelle, ed., Between the Empires: Society in India 200 BCE to 400 CE, New York: Oxford University Press, ISBN 0-19-568935-6 . Lahiri, B. (1974), Indigenous States of Northern India (Circa 300 B.C. to 200 A.D.), Calcutta: University of Calcutta . Pargiter, F.E. (1972), Ancient Indian Historical Tradition, Delhi: Motilal Banarsidass . Raychaudhuri, H.C. (1972), Political History of Ancient India, Calcutta: University of Calcutta .